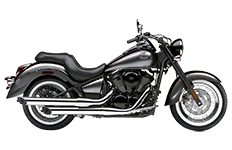 Relying upon years of proven reliability, Kawasaki's Vulcan 900 Classic and VN900 motorcycle models are truly legends in their own right. You wouldn't outfit a king in ordinary clothing, so why treat your bike the same way? Our collection of 900 saddlebags are designed specifically for these two bikes, giving you the ultimate road companion at an affordable price. If you're unsure of which particular model works best for your needs, give us a call and we'll help you choose!